Keen players in the global gable top caps and closures market are furthering their market shares through both the organic and inorganic route. Collaborations, acquisitions, and offering a broad range of products are some tried and tested methods used by them. One of the main growth drivers in the global gable top caps and closures market is the industry friendly innovative design in gable top cartons. This has made it possible to print different product and brand related information on it since it has a comparatively large surface area than other liquid packaging solutions such as bottles and cans. Besides, it is also aesthetically pleasing and hence serves to easily attract consumers. Further, gable top cartons offer ease of stacking during transportation and retailing. Posing a challenge to the global gable top caps and closure market is the volatile petroleum products prices. Since caps and closures are manufactured from plastics such as PP, PE, etc., which in turn is extracted from petroleum products, price fluctuation of the latter impacts the overall production cost. A report by Transparency Market Research predicts the global gable top caps and closures market to rise at a 5.7% CAGR from 2017 to 2025 to reach a value of US$79.1 mn in 2025 from US$48.5 mn in 2016. Based upon the type of product, the global gable top caps and closures market can be broadly divided into two – screw caps and flip caps. At present, the segment of screw caps leads the market with a significant share. The segment is slated to grow its share further by 2025 by expanding at a 5.9% CAGR between 2017 and 2025. This is because of their convenient features and applicability in different products packaged in gable top cartons. The consumption of screw caps segment is estimated to reach 4,019 million units by the end of 2025. 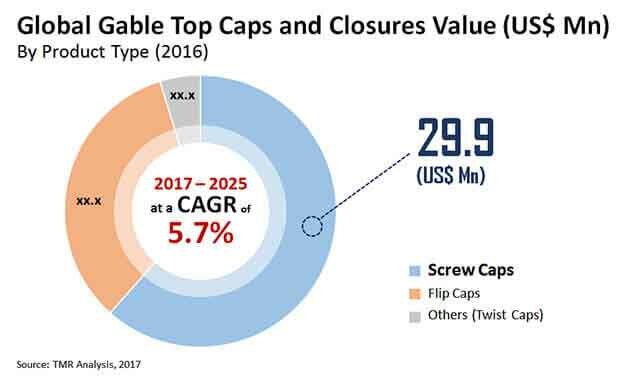 The consumption of the flip caps segment in the global gable top caps and closures market was around 958 million units by 2016-end. By clocking a CAGR of 5.1% from 2017 to 2025, it is predicted to become 1,428 million units by 2025. The flip caps segment was worth US$17.2 mn in 2016 and is forecasted to be US$26.0 mn by 2025-end. Geographically, the key segments of the global gable top caps and closures market are North America, Latin America, Europe, Asia Pacific, and the Middle East and Africa. Asia Pacific, of them, is a market leader that raked in an overall revenue of US$19.4 mn by the end of 2016. The application segment of beverages is primarily driving the growth in the market in the region. By clocking the maximum CAGR of 6.6% from 2017 to 2025, the segment will grow its share further in the next couple of years. North America trails Asia Pacific in terms of share in the global gable top caps and closures market. The U.S. leads the market in North America by dint of contributing the most to the revenue. Demand in the overall North America market, however, is slated to increase at a lackluster pace in the upcoming years on account of the market being saturated. Prominent players in the global gable top caps and closures market are BERICAP GmbH & Co. KG, Evergreen Packaging Inc., UNITED CAPS LUXEMBOURG S.A, Tetra Pak, International S.A., Elopak Inc., Silgan Plastic Closure Solutions, Closure Systems International, Inc., Berry Global, Inc., and O. Berk. The report begins with an overview of the global gable top caps & closures market, evaluating market performance in terms of revenue, followed by TMR’s analysis of key trends, drivers, and restraints witnessed in the global market. Impact analysis of the key growth drivers and restraints based on the weighted average model is also included in the report. To compute the market size, in-depth secondary research is done. Data points such as regional splits and market split by material type, product type and application has been assimilated to arrive at appropriate market estimates. The report comprises the forecast of the global revenue generated by the sales of gable top caps & closures market. TMR triangulates the data via different analysis based on supply side, demand side as well as the dynamics of gable top caps & closures market. Another vital feature of this report is the analysis of the gable top caps & closures market by region, material type, product type, diameter and application; and the corresponding revenue forecast in terms of absolute dollar opportunity. This is traditionally overlooked while forecasting the market. However, absolute dollar opportunity is critical in assessing the level of opportunity that a provider can look to achieve as well as to identify potential resources from a sales perspective of the Global gable top caps & closures market. To understand key segments in terms of their growth and performance in the gable top caps & closures market, Transparency Market Research has developed a market attractiveness index. The resulting index should help providers identify existing market opportunities in the global gable top caps & closures market. In the final section of the report, gable top caps & closures market competitive landscape is included to provide a dashboard view of companies that manufacture and provide services of gable top caps & closures market. The report contains company profiles of some of the key players in the global gable top caps & closures market. Some of the key players in global gable top caps & closures market include Bericap GmbH & Co. KG, Evergreen Packaging Inc., United Caps Luxembourg S.A, Tetra Pak, International S.A., Elopak Inc., Silgan Plastic Closure Solutions, Closure Systems International, Inc., Berry Global, Inc., and O.Berk.